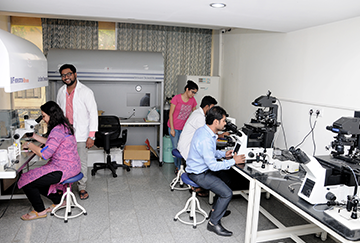 Our ART laboratories are -certified for high complexity testing, and state-of-the-art laboratory facilities bring the newest technologies in the andrology/embryology field into the region. Our modular lab structure and air filtration system, one of the few labs in the area that possesses this ability, makes the cleanest air environment possible for all IVF laboratory procedures for the best of embryo quality. Success rates for our ART program exceed the industry established rates. Center offers comprehensive services for the diagnosis and treatment of infertility . 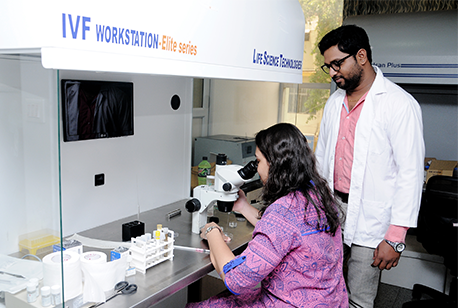 The CTTBC (Caree Test Tube Baby Center) IVF laboratory program includes services in all aspects of ART. It includes IVF techniques such as oocyte/ embryo culture, insemination (including ICSI), blastocyst culture and transfer, embryo cryopreservation, and laser assisted hatching. It is directed by our certified and nationally recognized embryology laboratory director, DR. Srinivas M. S.
CTTBC (Caree Test Tube Baby Center) IVF lab have been carefully assessing embryos on the first day after egg retrieval at the zygote, or 1-cell embryo stage. We use morphologic parameters of the pronuclei on day one as part of the overall embryo quality assessment, and also as part of their selection criteria for the best embryos to transfer. This assessment on day one is an interesting and possibly useful tool. By 48 hours ("day 2"), the embryos must be to at least 2 cells - or they have "arrested". We prefer that at least some of them are at the 3 or 4 cell stage by then. A blastocyst is an embryo which has developed to the point of having 2 different cell components and a fluid cavity. Human embryos, in culture in an IVF lab, or developing naturally in the female body, usually reach the blastocyst stage by day 5 after fertilization. Blastocyst transfer with IVF can give high pregnancy success rates with very low risk of triplets. However, under standard IVF culture conditions, only about 25-60% of human embryos will progress to the blastocyst stage after 5 days of culture.